Some men are all about the high fashion, sophistication when it comes to their preference in watches. Others may appreciate this kind, but may be seeking something with a little more of a sporty look to it. 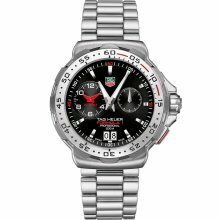 Those of you who this appeals to, look no further than the Tag Heuer Formula 1 Alarm Men’s Watch WAH111C.BA0850. This timepiece is one that could be described as “manly.” It is sleek, but doesn’t appear too fancy to not wear in your every-day routine, whether you are hanging around the house, at your son’s baseball game, or to the party your wife is dragging you to. This is all achieved through a combination of stainless steel and a highly-detailed watch face. The linked bracelet, case, bezel, and buckle clasp are all made of silver stainless steel. The bezel is also marked with hash marks and numbered at each 5-minute interval. The black dial also has minute hash marks and bolder ones for at each hour. The Tag Heuer label is placed just about 6 o’clock, as well as a date display. On the left hand side there is an alarm, and on the right a chronograph sub-dial. These additions are a definite plus for someone who would value their usefulness. Consumers who have purchased this watch describe it as a “beautiful timepiece” and having “good craftsmanship and overall quality.” They boasted its opulent appearance and how photogenic it was. Complaints included were purchasing it in-store being too expensive (Nordstrom sells it for $1,300). Some appreciated how shiny it was but for others this trait was a little too much, and the picture online didn’t quite live up to how “shiny” it actually was in person. For those who can put aside the minor flaws, mostly based on personal opinion, multiple deals can be found online that are much better than the store price. Overstock.com tags the Tag Heuer Alarm Men’s Watch WAH111C.BA0850 at $955.99, with no tax and only $2.95 for shipping. The best price you can find is on Jomashop.com for $959.00. The no tax and free shipping makes is worth the few dollars more. Amazon.com offers for $959.00, a few dollars more. And although their shipping is free, there is a $91.00 tax placed on the product. The Tag Heuer CV2014.BA0786 is very similar to the Tag Heuer WAH111C.BA0850 based on the black dial, but it does have a few more minor features and much more costly price. Now you could be the guy who picks up a smart-looking watch at a small, cheap retail store, but go for this WAH111C.BA0850 and you’re sure to be the stud with the sporty AND stylish accessory!